It's pretty amazing the popularity of DC Comics' 'Suicide Squad.' The property dates back to 1959 but found a resurgence in 1987. Now with a live-action feature film coming this August with fan favorite Harley Quinn, herself a best-selling solo character title, at its center the time couldn't be better to capitalize on Task Force X.
DC's "Rebirth" will relaunch books across the line including a new 'Suicide Squad' series written by Rob Williams and art by the legendary Jim Lee. Take a first look at the cover of issue #1 courtesy of Williams' Twitter post. The cover features pencils by Lee, inks by Scott Williams and colors by Alex Sinclair. 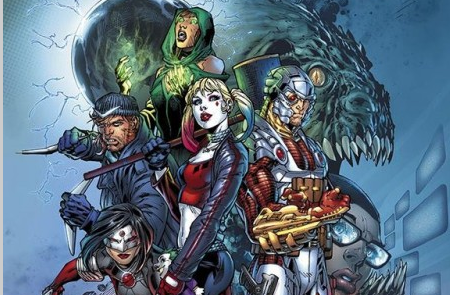 The initial line-up includes Harley Quinn, Deadshot, Enchantress, Katana, Captain Boomerang, and Killer Croc. It mirrors for the most part their movie counterparts. Although, this being the 'Suicide Squad,' that line-up is likely to change as some may meet their doom along the way. 'Suicide Squad' #1 hits stores and online on August 17.